Nearly everyone has heard of Key West, but its remote location has kept many from visiting, so it tends to have a mysterious reputation among some people. A big part of its appeal is that it marks the very end of the 127-mile Overseas Highway, which starts south of Miami and connects dozens of small islands with the mainland. While it is one of the world’s great drives, traffic can be heavy, and the longest span is under 7 miles, while most other bridges are under 1 mile each. In other words, much of it feels more like a penisula than distant islands connected by long bridges, but still the scenery is gorgeous. There are two major differences between Key West and the rest of Florida, one being more subtle than the other. The harder to notice difference is that Key West is actually tropical, meaning that it officially lies within the tropics, so there is even less seasonal temperature variation than in Miami. Another result is that there has never been frost reported in Key West, making it the only city in the so-called Continental US to make that claim. The more noticeable difference is that Key West very much feels like an island. Even though most people arrive by car over the bridges, there is that unmistakable feeling of being in a very remote place in the tropics. There’s just a certain extra dimension to life in a place where the nearest large city (Miami) is at least three hours away, and even Miami feels like everyone’s on vacation. Another important thing to note is that there are two Key Wests in a way. One Key West is the touristy one centered around Duval Street, Mallory Square, the Hemingway House, and that phony Southernmost Point in the US marker. There are hotels through this tourist section, with bars and restaurants lining Duval Street and a few other in the area. Key West is also very pet friendly (as a matter of fact it is nearly anything-friendly) and there are pet friendly hotels in Key West for those who want to go check it out and bring their pets along. The other Key West is the one the locals know. Many retired people have houses in Key West, including quite a few who aren’t of retirement age yet, and for these people and those who work in the tourist businesses, they have their own restaurants and shops on the quieter streets away from the tourist area. Sunset at Mallory Square is a tradition for tourists, but it’s not all that relaxing when you are surrounded by 500 other people and countless street performers. Those wanting to avoid large crowds can find places without much trouble if they are interested. Those looking for lower prices and more solitude can also choose from many of the other keys along the Overseas Highway. Key Largo is just south of the mainland, and there are many places to stay there, with most of the others being much smaller and more mellow. 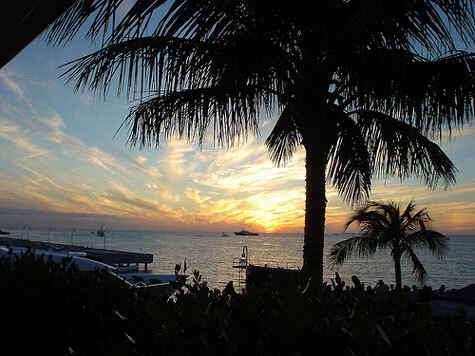 As wonderful as it is, Key West can be extremely expensive, especially for tourists. Finding a hotel for under US$100 is a feat, even during the slow season. On the other hand, many thousands of the locals who work at the bars, hotels, and restaurants are not rich, so finding affordable (if not very posh) apartments is not too difficult once you arrive and make a few friends. Food and drinks tend to cost a bit more than in Miami, but only by a bit. There’s almost no really high end shopping, and few luxury resorts, so prices on almost everything tend to be only a bit higher than on the mainland, and not as ridiculous as you might otherwise fear. Flying to Key West – Flights to Key West International Airport are served primarily from other airports in Florida so a cheap flight to Miami for a connection is probably your best bet, although you can also get there by a connecting flight to Atlanta also. Key West Express Ferry – Not many people seem to know about this option. First, find your way to Fort Myers Beach, and then take the Key West Express Ferry boat. It’s about a 3 1/2 hour trip and a round trip ticket costs about $110 per person. You can also book one-way fares and they will accept pets and bicycles should you want to transport those also. Driving to Key West – If you don’t want to fly from Miami and want the experience of driving through the Florida Keys, you can also drive to Key West. It is only about a 160 mile drive, but if you want to drive it straight through without staying overnight in the other keys, expect it to take somewhere near 4 hours on a good day. The speed limit is low, and in all but rare cases the road is one lane each way. During peak season, 5-6 hours is not uncommon.